Another way to look at BI is the type of questions being asked and answered. The simplest model developed by TDWI is shown here. According to a Gartner report, the software market for BI, analytics and corporate performance management grew by 16.4% in 2011 to $12.2 billion in 2012 and 14.1 in 2013. Companies are investing in software platforms to answer 3 critical performance questions: How are we doing? Why? What should we be doing? 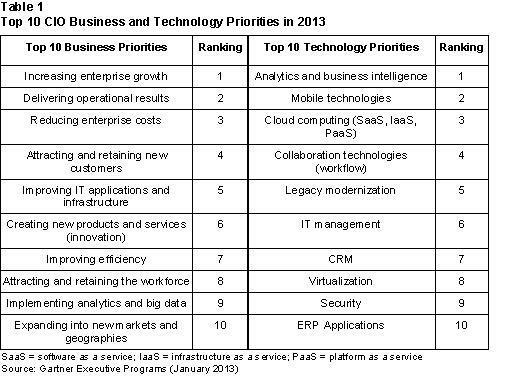 This category is expected to have robust growth as BI and Analytics are rated #1 priorities in corporate IT. Also new growth is coming from the Big Data — integrated appliances like Oracle Exadata, IBM Netezza, SAP HANA, EMC GreenPlum. I also see explosive growth in industry specific analytics categories like retail customer/predictive analytics. BI platform software sales was tallied at $7.79 bln. Gartner identified SAP revenue as $2.88 billion, up 19.5 percent from 2010). 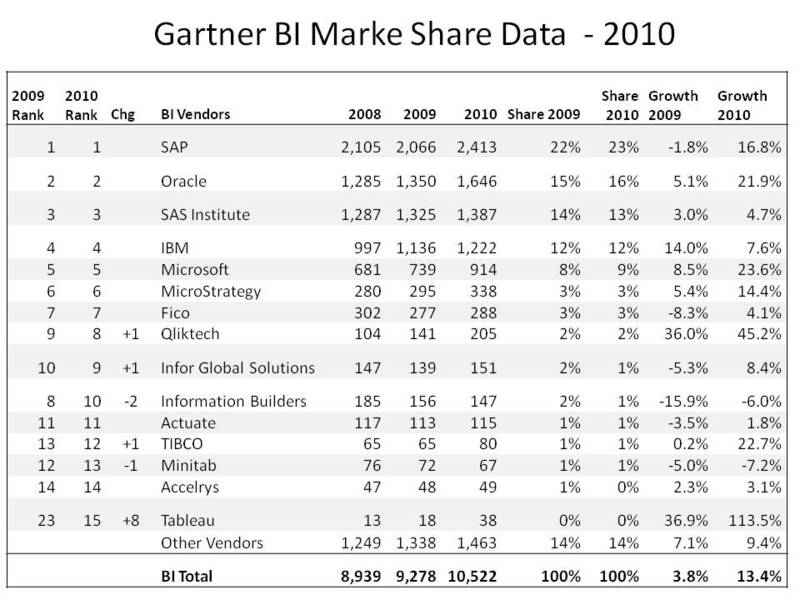 SAP is the market share leader in the BI, analytics, and PM software space. Second is Oracle, with $1.9 billion in 2011 revenue, which, along with third-ranked SAS Institute ($1.54 billion in 2011 revenue) saw a dip in market share. IBM registered $1.47 billion in software revenue in 2011 and 12.1 percent of the market share to come in fourth, and Microsoft totaled $1.05 billion in 2011 revenue with a steady 8.7 percent of the market share. 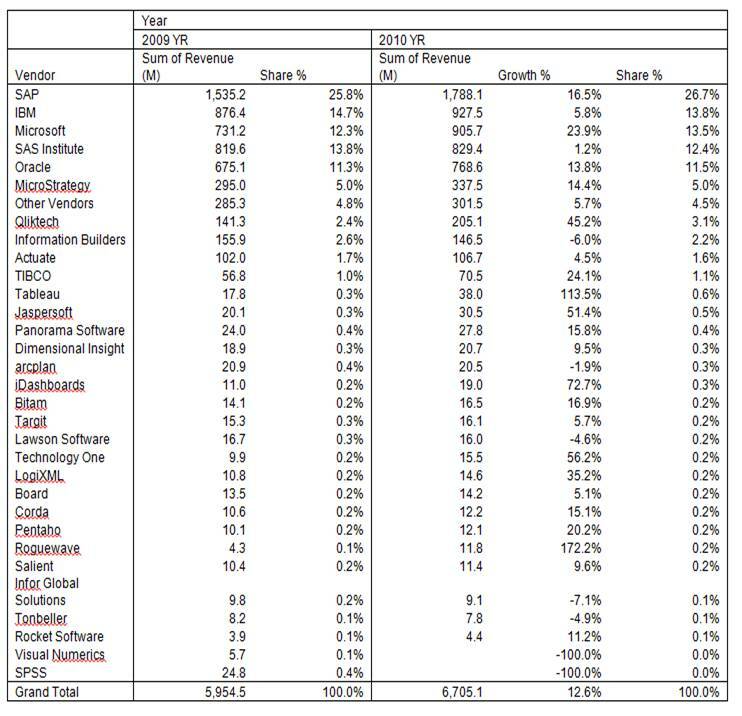 IBM’s marketshare (via acquisitions) is definitely increasing as it accelerates its rapid-fire acquisition strategy to penetrate the market: Cognos, Netezza, SPSS, ILog, CoreMetrics, Algorithmics, OpenPages, Clarity Systems, Emptoris, DemandTec (for retail). IBM also has other complementary assets like Watson, DB2 etc. They are building a formidable capability around the value chain: “Raw Data -> Aggregate Data -> Intelligence ->Insight -> Decisions” . They see this as a $20Bln opportunity in managing the data, understanding the data and then acting on the data. According to Gartner’s report, the Big 5 vendors (SAP, Oracle, SAS, IBM and Microsoft) continue to dominate, owning 68 percent of the market share. In the BI platform and CPM suite segments, they hold close to two-thirds market share, while in pure statistics and analytic applications, SAS dominates the market. There is ongoing BI tools consolidation (Visualization, ETL, Reporting, Datawarehouses) in the IT departments, while, at the same time, a new wave of lighter footprint data visualization tools and analytic applications are proliferating in line of business units. In-memory and Mobile BI are two new categories that are growing rapidly. We have seen a tremendous amount of interest in customers for iPad based analytics (CxO analytics). Business users care less about who they buy from; they want easy-to-use, domain-specific functionality and speed-to-market. Business users don’t want long deployment cycles. Growing frustration with BI application performance, availability and latency are causing a spurt of investment in purpose-built data appliances like Oracle Exadata. Gartner Analyst Dan Sommer remarked that the growth reflected uptake of an “information-driven” approach. ““It is clear that BI continues to be a technology at the center of information-driven initiatives in organizations,” he said. We expect faster category growth in 2012, 2013 and 2014 as companies make more pro-growth investments and also make catchup data and BI infrastructure investments as they come of the deep 2008-2009 recession. The detailed marketshare data looks like this. While the Gartner estimate is only for software and doesn’t include Systems Integration, Professional Services and specialized software/hardware (Big Data [e.g., Hadoop], BI appliances, Solid State Devices (SSD)). Also it not clear if Gartner is including new emerging areas like Social Media Analytics, Analytics-as-a-service in their estimate. IDC says the Analytics market is a 51B business by 2016. Also it is not clear if they are including industry specific analytics spend. For instance in retail I see significant investments in areas like Markdown, Customer and Web Analytics that are provided by specialist firms. A good example is dunnhumby in U.K which is used by many large retailers like Tesco, Kroger, Macy’s for loyalty database management, pricing and markdown analytics, and data mining. The numbers don’t include the massive investment in peta-bytes of storage that is being driven by Analytics. Large “cloud” or virtual storage models and storage tiering—the process of moving stored assets according to their value— are being implemented everywhere to drive down costs and improve resource utilization. 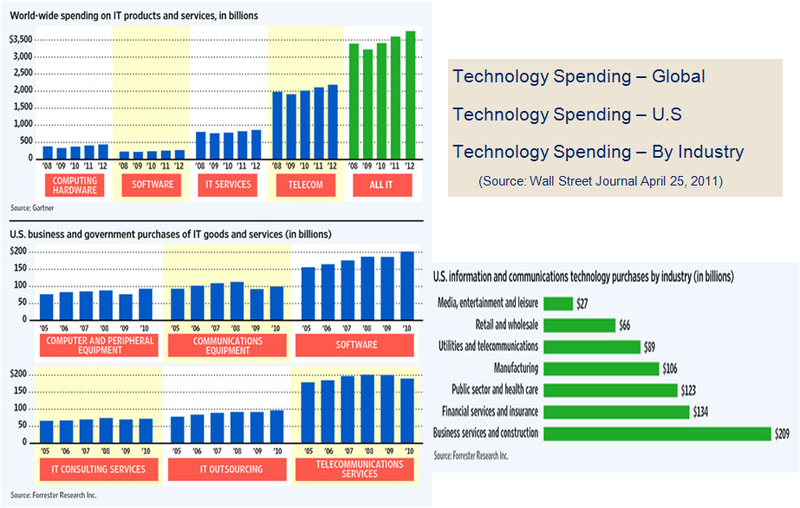 We estimate that the BI, Analytics and CPM market is closer to $50 Bln with these included. This is becoming a growing category in the overall global technology marketplace estimated to be $1.8 Trillion (excluding Telecom Services). According to the Gartner report, “The global recession that swept the world had a major impact on markets and for a period of time, especially the first half of 2009, paralyzed them. While IT spending overall was negative during that time, the BI market managed to grow 4.2 percent in 2009. 1) Performance, availability and latency issues in current BI solutions is causing a growth spurt in Data Appliance category (e.g., Oracle Exadata, EMC Greenplum, IBM Netezza etc.). Performance improvements come from offloading I/O intensive processing to a purpose-built appliance which uses caching and other techniques to dramatically improve latency of apps like SAP BusinessObjects. 2) Business demand for rapid access to new insight. Pressure to leverage real-time insights is spurring the investment and development of fast, what-if planning tools and in-memory analysis capabilities. 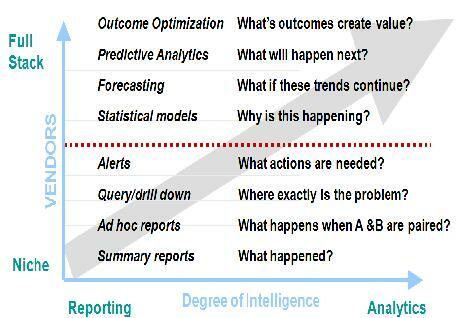 It has also fueled interest in predictive analytics to get out ahead of emerging demand, risk and opportunity. Mobile delivery, cloud computing (analytics-as-a-service) and Big Data would also figure heavily in coming years. These are still emerging areas, far short of widespread implementation. 3) Speed of the upgrade cycle. Many enterprise customers are now faced with what seems to be a Hobson’s Choice – sticking with an older (fully or partially depreciated) but more stable version of BI Platform that SAP, Oracle and others may soon no longer support, or moving to a costly, supported newer version but potentially hobbled by bugs and instability. 4) Continued investments in foundational data and information management (IM), the below the waterline and messy part behind BI. IM includes data discovery, modeling, integration, data cleansing and database optimization—all difficult, time-consuming challenges. 5) Consolidation and M&A Integration. Invariably just when IT gets its arms around existing information, it seems the business side invariably hits the reset button on BI and IM demands by merging with or acquiring another company. This usually causes several new projects. The future belongs to the companies who figure out how to manage the entire data life cycle – where it comes from, how you collect and use it, and where it goes – successfully. Data was always king but BI has amplified its importance. BI tools are making data easier to manage, store, maintain and classify. Better access to data is allowing businesses to employ evidence-based decision making at all levels of their organizations. The ease of collecting data is driving organizations to look at how they can best use the information. The race is on to provide… Relevant Information, Better Outcomes, Smarter Decisions, and Actionable Insights. For a look at the vendor landscape that makes up these numbers see – The Vendor Landscape in BI and Analytics. Good analysis. The problem with going on revenue is that it discounts the share of homegrown or open source. It measures sales rather than overall usage and footprint. I’d also like to see if the SAS revenue data, for example, includes stats software as well as BI. It’s no longer Business Intelligence! 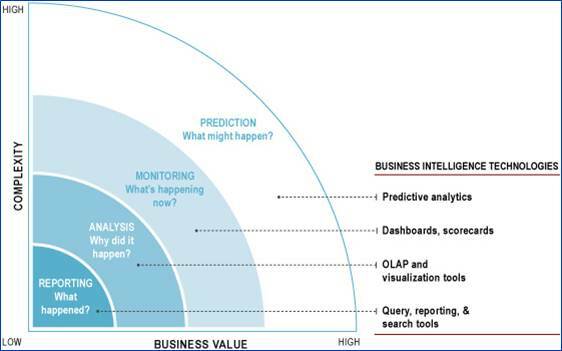 Gartner has acknowledged the market trend and dropped the unwieldy category name “Business Intelligence and Performance Management” in favor of the simpler umbrella term “Business Analytics”, following in the footsteps of other analysts (e.g. 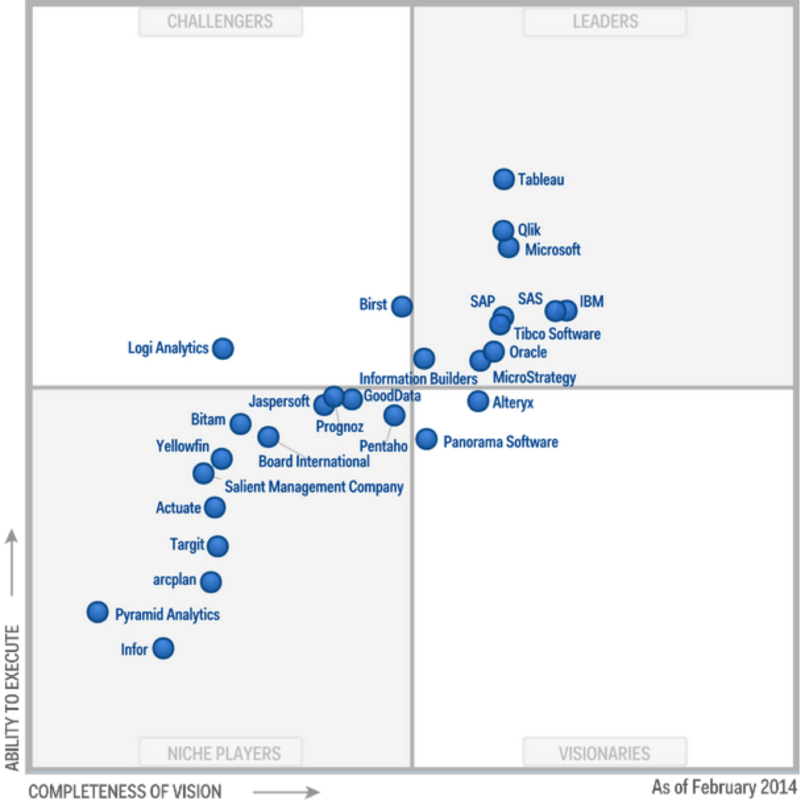 IDC) and vendors (Oracle, SAS, SAP, etc.). It is no longer BI Competency Centers…. Gartner is also shifting from BI Competency Centers (BICCs) to Business Analytic Teams (BATs) – probably because the word “center” (a) doesn’t really represent the reality of diversified real-world organizational structures; (b) power shifting to the business units from centralized IT. Qliktech growth is tremendous.. great going QV..
I’m excited to find this site. I wanted to thank you for ones time due to this fantastic read!! I definitely enjoyed every little bit of it and i also have you book marked to check out new information in your site. a $14.1 Bln market | Business Analytics 3.0 <Loved it!